Ixodiphagus hookeri is a parasitic wasp of ixodid ticks around the world. It has been studied as a potential bio-control agent for several tick species. We suspected that the presence of Wolbachia infected I. hookeri eggs in ticks is responsible for incidental detection of Wolbachia DNA in tick samples. The 28S rRNA and 16S rRNA genes of a specimen of I. hookeri was amplified and sequenced. PCR on part of the 28S rRNA gene was used to detect parasitic wasp DNA in 349 questing Ixodes ricinus ticks from various sampling sites. Furthermore, the wsp gene of Wolbachia was sequenced from the I. hookeri specimen and a subset of ticks was tested using this marker. Several sequences from tick specimens were identical to the Wolbachia sequence of the I. hookeri specimen. Ixodiphagus hookeri was detected in 9.5% of all tested ticks, varying between 4% and 26% depending on geographic location. Ten out of eleven sampling sites throughout the Netherlands were positive for I. hookeri. Eighty-seven percent of I. hookeri- positive but only 1.6% of I. hookeri-negative ticks were Wolbachia positive. Detection of I. hookeri DNA was strongly associated with the detection of Wolbachia in ticks. This is the first reported case of I. hookeri in the Netherlands. Furthermore I. hookeri harbours Wolbachia species and is broadly distributed in the Netherlands. While detection of Wolbachia DNA in ticks might often be due to parasitism with this wasp, other sources of Wolbachia DNA in ticks might exist as well. Ticks carry numerous microorganisms, ranging from highly pathogenic bacteria to intracellular symbionts. In addition to well-known pathogens including Rickettsia spp., Borrelia burgdorferi s.l. and Anaplasma spp., more and more tick-associated bacteria are discovered with molecular techniques. Initially, the role of such microorganisms for the tick or in the context of public health remains unknown. Several examples can be named here, ranging from probable endosymbionts of ticks like 'Candidatus Midichloria mitochondrii' to 'Candidatus Neoehrlichia mikurensis' which was found recently to be involved in several cases of severe human disease [1–9]. Bacteria belonging to the group of Wolbachia pipientis have been detected in several studies in Ixodes ricinus ticks [10–13]. Bacteria from this group are known endosymbionts from a high variety of insects, mites and nematodes. They act, depending on the Wolbachia strain and host species, as mutualistic, commensalistic or parasitic symbionts [14–16]. Wolbachia have been shown to influence the reproduction of infected insects in various ways, including parthenogenesis, male killing, cytoplasmic incompatibility and feminization . So far, the role of Wolbachia in ticks remained unclear [10, 13]. Its prevalence was usually too low to be explained by obligatory symbiosis and it remained unclear how the ticks became infected. In the current study we offer an explanation for the source of Wolbachia sequences amplified from ticks. Unexpectedly, three wasps hatched in our laboratory from an engorged nymphal I. ricinus tick. In accordance with the origin of the wasps we suspected these to be Ixodiphagus hookeri (Howard), a parasitoid of ticks belonging to the order Hymenoptera and the family Encyrtidae. I. hookeri is known to occur on all continents except for Antarctica and to infest various tick species . So far, it had not been reported from the Netherlands. Mating of I. hookeri occurs shortly after emerging from their tick host . Females then search for a suitable tick host and oviposit several eggs per tick, for I. ricinus up to 15 wasps per nymph have been observed . In a European setting unfed nymphs of I. ricinus are preferred above I. ricinus larvae and fed nymphs . Worldwide at least 14 ixodid tick species, including several Ixodes spp., have been found to be suitable hosts. Suitability, however, might depend on the I. hookeri strain [17–19]. I. hookeri has been investigated for its potential as biological tick control agent with variable results [17, 20]. The discovery of parasitic wasps in Dutch ticks led to the suspicion that Wolbachia sequences from ticks previously identified in our laboratory and reported from other studies [10, 12, 13, 21] might in fact be due to Wolbachia endosymbionts of tick parasitoids. We tested this by initially testing the parasitic wasp for Wolbachia. Ticks were examined for the presence of parasitoid DNA and Wolbachia by PCR to investigate associations between these two parameters. Additionally, the prevalence and distribution of I. hookeri in the Netherlands was investigated by testing ticks from various sites throughout the country. Three specimens of parasitic wasp hatched from an engorged I. ricinus nymph that had been collected from sheep in a nature reserve area in the south-west of the Netherlands on September 7th, 2010. Ticks had been pooled per sheep and stored in 50 ml polypropylene tubes at room temperature, approximately 80% relative humidity and a natural day/night cycle. The parasitic wasps hatched between October 2010 and January 2011 and were discovered on January 10th, 2011. Two specimens were sent to the Natural History Museum, London, for taxonomic determination while the third specimen remained in our laboratory for molecular investigations. Total DNA was extracted from one specimen by alkaline lysis as described elsewhere . Pilot test: From several studies from recent years (2008-2010) 27 Wolbachia positive ticks tested by reverse line blot (RLB) (as described in [12, 22]) were selected. Additionally, one Wolbachia negative tick from the matching study was selected for each positive tick. In order to determine the distribution and prevalence of I. hookeri in the Netherlands adult and nymphal ticks from eleven different locations across the Netherlands were tested. Depending on availability, between 19 and 48 ticks per location were tested (for one location only 3 ticks were available). Total DNA was extracted from the ticks by alkaline lysis as described elsewhere . Several primer pairs (Table 1) targeting the 16S rRNA or 28S rRNA genes were tested on DNA extracted from an I. hookeri (Howard) specimen. As a positive control, DNA of Vespula vulgaris was used. PCR products were analyzed on agarose gels. All primer pairs yielded bands for V. vulgaris DNA and all but the 16S-F1/16S-R1 combination yielded PCR products for I. hookeri ( Howard). Ticks from the pilot study were tested for the presence of Hymenoptera DNA by amplification of part of the 28S rRNA gene using primer pair 28S-F1/28S-R1 and part of the 16S rRNA gene using primer pair 16S-F2/16S-R1. Ticks from the prevalence study were tested with primer pair 28S-F1/28S-R1. PCR was done using HotStarTaq master mix (Qiagen, Germany) with the following conditions: 15 min at 95°C, then cycles of 30 s at 94°C, 30 s at 65°C, 60 s at 72°C, lowering the annealing temperature by 1°C each cycle until reaching 55°C, then 35 cycles at this annealing temperature followed by a final elongation step for 7 min at 72°C. Samples were analyzed on agarose gels. DNA of the I. hookeri specimen and ticks were tested for the presence of Wolbachia DNA by amplification of part of the wsp gene using primer pair wsp81F/wsp691R (Table 2) . PCR was done using HotStarTaq master mix (Qiagen, Germany) with the touch down PCR protocol as described above with a starting annealing temperature of 60°C and a final annealing temperature of 50°C. PCR products were sequenced using an ABI PRISM Big-Dye Terminator Cycle sequencing Ready Reaction kit (Perkin Elmer, Applied Biosystems). All sequences were confirmed by sequencing both strands. Sequencing of the Wolbachia wsp gene indicated double infections with Wolbachia in some tick samples and for these specimens additional sequencing primers were used (wspF2a, wspF2b, wspR2a, wspR2b) (Table 2). Resulting sequences were compared with sequences in Genbank using BLAST. Positive and negative predictive values with regard to Wolbachia wsp PCR results as predictors for a positive and negative PCR results for Hymenoptera DNA were calculated. Additionally the significance of the association between these two PCRs was tested using Mid-P exact test . 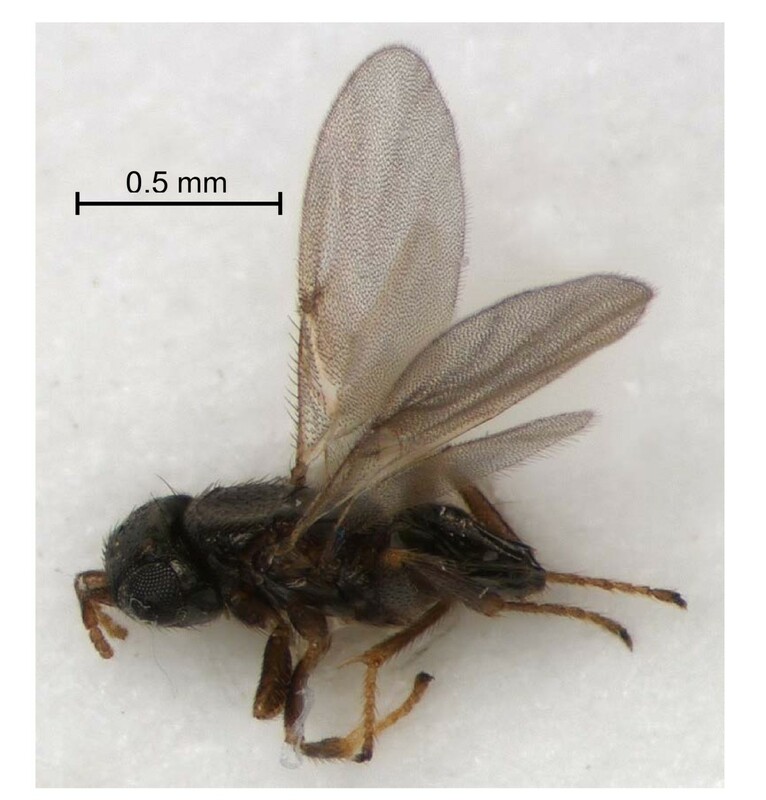 The collected parasitic wasps were morphologically identified as Ixodiphagus hookeri (Howard) by John Noyes at the Natural History Museum, London (Figure 1). This species had previously not been reported from the Netherlands and has in the meantime been added to the list of Dutch Chalcidoidea and the Dutch Species Catalogue . Ixodiphagus hookeri (Howard) hatched from an Ixodes ricinus nymph (Photo: Oscar Vorst, Naturalis). The 28S rRNA and 16S rRNA genes of I. hookeri were successfully amplified and sequenced. After clipping off the primer sites, sequences of 824 bp and 318 bp were obtained, respectively. BLASTing of the 28S rRNA and 16S rRNA sequences gave closest matches with the hymenopteran parasitoids Plagiomerus diaspidis (accession code AY599316, 84% identity) and Cotesia flaviconchae (AJ535921, 80% identity, 89% coverage), respectively. Sequencing of the Wolbachia wsp gene yielded a sequence of 573 bp with no indications of double infection. BLASTing of the wsp sequence gave close matches with a number of Wolbachia endosymbionts of various insects. A phylogenetic tree based on the wsp gene was calculated (Figure 2). Phylogenetic analysis of Wolbachia from various invertebrate host species. Neighbor-joining trees with Kimura correction were based on wsp genes from this study and mined from GeneBank. 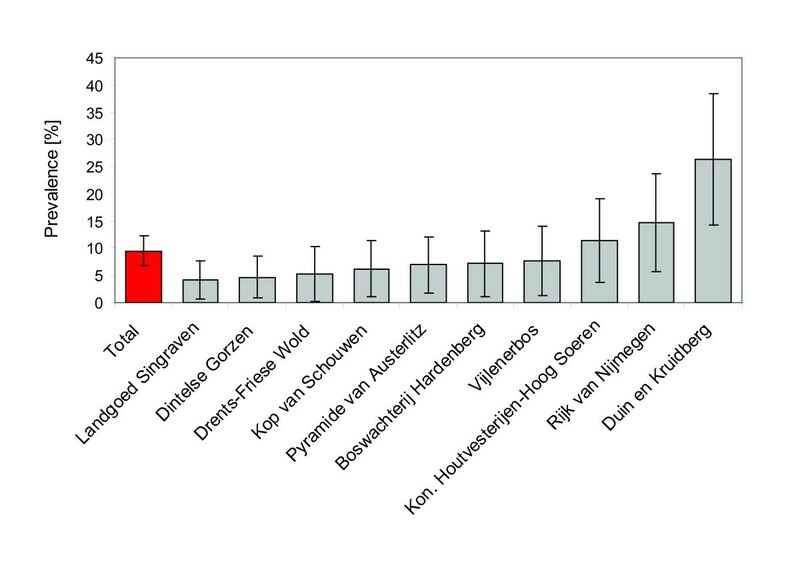 Bootstrap proportions were calculated based on 500 replicates, only values < 80 are indicated. Fifty-four ticks were tested for the presence of I. hookeri and Wolbachia DNA. Amplification of the 16S rRNA gene yielded unspecific products, which were not used for further analysis. Amplified products of 28S rRNA and wsp genes were sequenced. 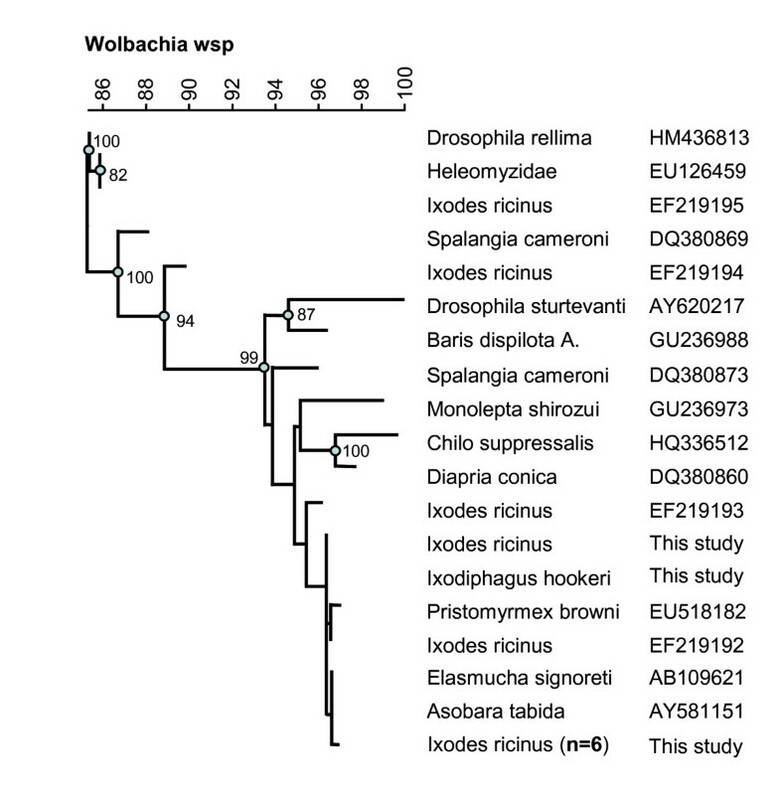 Most RLB Wolbachia-positive ticks were positive for 28S rRNA as well as wsp genes. Five ticks of this group were positive for the wsp gene but delivered no or divergent 28S rRNA sequences. One tick was I. hookeri positive but did not produce a wsp amplification product. Four RLB Wolbachia-positive ticks were negative for either PCR. Twenty-four of 27 ticks from the RLB Wolbachia-negative control group yielded no PCR products for either 28S rRNA or wsp genes. Two ticks yielded 28S rRNA sequences different from I. hookeri and one tick yielded a wsp sequence different from the I. hookeri isolate. Wolbachia wsp sequences from several I. hookeri positive ticks failed to be sequenced in adequate length and quality, which was apparently due to double infection with multiple Wolbachia strains. A total of 341 ticks were tested for the presence of I. hookeri PCR amplification of the 28S rRNA gene. Additionally 143 of these ticks were tested for Wolbachia by amplification of the wsp gene. Ixodiphagus hookeri DNA was detected in 9.7% (n = 33) of all ticks. Ten of eleven locations were found positive with a prevalence ranging from 4% to 26% (Figure 3 and 4). For the remaining site only 3 ticks were available, which were all negative. Of the 143 ticks tested for Wolbachia, 10.5% (n = 15) were found positive (Table 3). Two ticks that had been found positive for I. hookeri DNA were negative for Wolbachia and vice versa. A tick positive in the Wolbachia PCR had a probability of 87% to be positive for I. hookeri as well. Likewise, a negative Wolbachia result predicted a negative I. hookeri PCR with a probability of 98%. The association between PCR results for Wolbachia and I. hookeri DNA was statistically significant (p-value < 0.0001). Locations in the Netherlands with PCR verified presence of Ixodiphagus hookeri infested Ixodes ricinus ticks. Drents-Friese Wold; 2. Boswachterij Hardenberg; 3. Landgoed Singraven; 4. Duin en Kruidberg; 5. Pyramide van Austerlitz; 6. Koninklijke Houtvesterijen Hoog Soeren; 7. Hullenberg; 8. Rijk van Nijmegen; 9. Kop van Schouwen; 10. Vrouwenpolder; 11. Dintelse Gorzen; 12. Vijlenerbos; Two of these sites (7 and 10) were found positive in the pilot study; the remaining sites were investigated in the prevalence study. Prevalence of the parasitic wasp Ixodiphagus hookeri in various locations spread over the Netherlands. Error bars indicate 95% confidence intervals calculated with Mid-P exact test. DNA of I. hookeri was detected in ticks collected from locations broadly distributed across the Netherlands. Although this is the first notice of this species in the Netherlands the broad distribution and the cosmopolitan distribution of this insect indicates that the wasp is a native species. The prevalence varies strongly with sampling location as had been reported from other studies as well [26, 27]. The prevalence might influenced by biological or climatic factors. Tick density, which in turn is affected by tick-host abundance, has been suspected to be a major determinant for the prevalence of I. hookeri. This corresponds with the finding that the highest I. hookeri prevalence in this study was found in 'Duin & Kruidberg' (Figure 4), an area with exceptional high tick density (data not shown). However, another area with comparable tick density, 'Kop van Schouwe', had a much lower I. hookeri prevalence. Other factors like (micro)climate, vegetation and prevalence of different vertebrate species in the habitats might play a role, but such data were not collected during this study. The molecular data suggest that I. hookeri, as many other insects, may harbour at least one Wolbachia strain. The specimen studied here was infected with a Wolbachia strain similar to that of other Hymenoptera but also closely matched Wolbachia endosymbionts of insects from different orders. Although the specimen hatched in our laboratory was apparently infected with a single strain, several I. hookeri positive ticks harboured multiple Wolbachia strains. Multiple infections with Wolbachia are known to occur in insects [28, 29] and the combination of these might have different biological impacts on their hosts. Wolbachia have been linked to parasitoid specialization  and different Wolbachia strains in I. hookeri might be one explanation for apparent differences in its biology in different countries [18, 19, 31]. Detection of Wolbachia DNA in ticks in this study is strongly correlated with I. hookeri infestation. The small deviation between PCR results might be explained by different sensitivities of PCRs. On the one hand, some I. hookeri might have no or only a low Wolbachia load while others might have a high bacterial load. On the other hand, the copy number of the 28S rRNA gene, which was used to detect I. hookeri in this study, is not known for this species and will influence the PCR sensitivity for this target. Furthermore PCR products from the prevalence study were not sequenced. Therefore, some of the wsp and 28S rRNA positive PCR results might have been due to environmental contamination of samples with Wolbachia or insect species not related to infestation of ticks. Data on spread and prevalence of I. hookeri around the world is scarce. The specificity of the I. hookeri PCR could be increased for future studies by the use of primers with high specificity, which can now be designed based on the 16S rRNA and 28S rRNA sequence data from this study. In future, molecular methods can be used to examine the spread and prevalence of I. hookeri in different tick species and regions. We report for the first time the detection of I. hookeri in Dutch ticks and the presence of Wolbachia in I. hookeri. This is, to our knowledge, the first reported study investigating the prevalence of I. hookeri in tick populations with molecular methods. I. hookeri seems to harbour Wolbachia endosymbionts, which can explain previous reports of Wolbachia isolates from I. ricinus ticks. In case they are endosymbionts of parasitoids, and not of the ticks themselves, these Wolbachia are unlikely to play a role in human diseases. The authors thank Roy Kleukers for his advice and inclusion of Ixodiphagus hookeri in the Dutch Species Catalogue. We are grateful for expert identification of the parasitic wasps by John Noyes, Natural History Museum, London. ETK performed laboratory analysis, analyzed data and wrote the first draft. MB coordinated wasp identification and contributed to the study design. EJS collected and provided ticks. HS contributed to the study design and wrote the final manuscript. All authors approved the final version of the manuscript.